Dramatic images of a police helicopter flying over Caracas, Venezuela, began circulating on social media Tuesday evening, with dictator Nicolás Maduro claiming that the helicopter had shot at and thrown grenades at the headquarters of the nation’s Supreme Court. The Venezuela Supreme Court is closely tied to the socialist leadership and attempted to install itself as the nation’s legislature in March. The U.S. Treasury has sanctioned all eight members of the nation’s court of last resort. The man visible flying the helicopter in question has been identified, according to Miami’s El Nuevo Herald, as Oscar Pérez, a police officer with the unit to which the helicopter belongs. In a bizarre development, videos began surfacing on an Instagram account believed to belong to Pérez apparently showing him surrounded by masked fighters, condemning the Chavista regime. Univisión notes that, in his message following the incident, Maduro claims that Pérez was once the pilot for Miguel Rodríguez Torres, a former Venezuelan justice minister who has turned on the regime. Maduro’s government has tied Rodríguez Torres to the CIA and floated conspiracies linking him with Western pro-democracy interests. Venezuela’s state media outlet, VTV, claimed that the helicopter incident was “financed by sectors of the opposition” and part of a greater “coup” attempt against him. Maduro has repeatedly accused the United States – and former vice president Joe Biden in particular – of organizing coup plots against him. Maduro announced that no known injuries had occurred as a result of the helicopter incident but noted that a social event was taking place at the Supreme Court at the time, which could have resulted in casualties should the helicopter have attacked. Shortly before reports began surfacing of the helicopter appearing over Caracas, a group of armed Chavista thugs known as colectivos stormed the headquarters of the National Assembly, the opposition-controlled federal legislative body. “The government supporters launched at least five explosive artifacts towards the interior of the legislative headquarters,” according to Venezuelan newspaper El Nacional. Opposition legislators were in the building at the time though none reported injuries. Prior to his statement on the helicopter, Maduro had asserted that he would resort to violence if his call to discard the constitution in his favor did not win at the polls. “If Venezuela was plunged into chaos and violence and the Bolivarian Revolution destroyed, we would go to combat. We would never give up, and what couldn’t be done with votes, we would do with weapons, we would liberate the fatherland with weapons,” he threatened, according to Reuters. 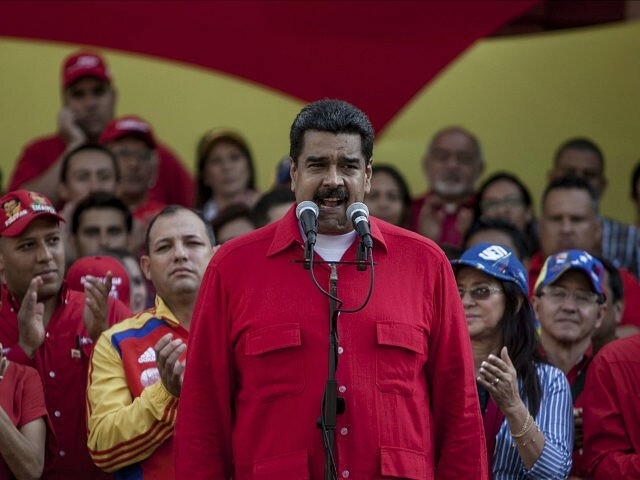 President Trump has repeatedly condemned the Maduro regime and called for a restoration of the democratic order in the South American country.